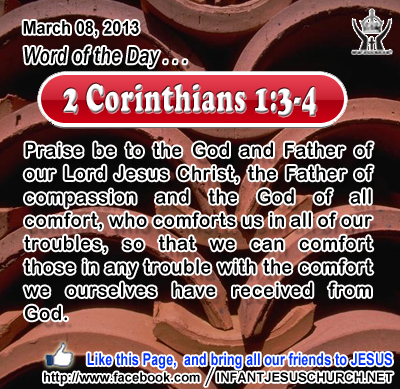 2 Corinthians 1:3-4: Praise be to the God and Father of our Lord Jesus Christ, the Father of compassion and the God of all comfort, who comforts us in all of our troubles, so that we can comfort those in any trouble with the comfort we ourselves have received from God. The Pharisees prided themselves in the knowledge of the law and their ritual necessities. They made it a life-time perform to study the six hundred and thirteen precepts of the Old Testament along with the many rabbinic commentaries. They tested Jesus to see if he correctly understood the law as they did. Jesus troubled them with his profound simplicity and mastery of the law of God and its purpose. What does God require of us? Just that we love as he loves! God is love and all he does flows from his love for us. God loved us first and our love for him is a response to his exceeding grace and compassion towards us. The love of God comes first and the love of neighbor is confidently grounded in the love of God. The more we know of God's love and truth the more we love what he loves and refuse what is hateful and contrary to his will. Now, what makes our love for God and his commands grow in us? Faith in God and hope in his promises make stronger us in the love of God. They are essential for a good association with God, for being united with him. The more we know of God the more we love him and the more we love him the greater we believe and expect in his promises. The Lord, through the gift of the Holy Spirit, gives us a new liberty to love as he loves. Do we allow anything to keep you from the love of God and the happiness of serving others with a generous heart? Paul the Apostle says: hope does not dissatisfy us, because God's love has been poured into our hearts through the Holy Spirit which has been prearranged to us. Do we know the love which conquers all?.